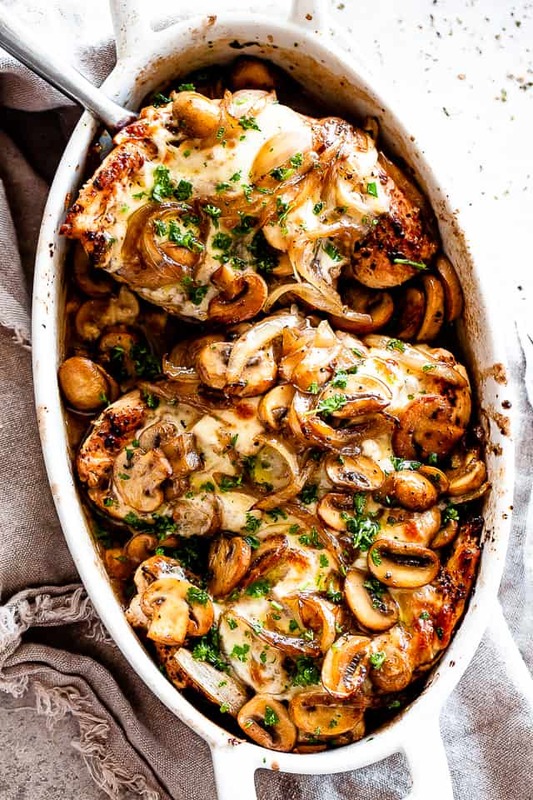 An easy recipe for baked chicken breasts covered in melty mozzarella cheese and layered with deliciously caramelized mushrooms. This effortless chicken dish is a great dinner for any night of the week. 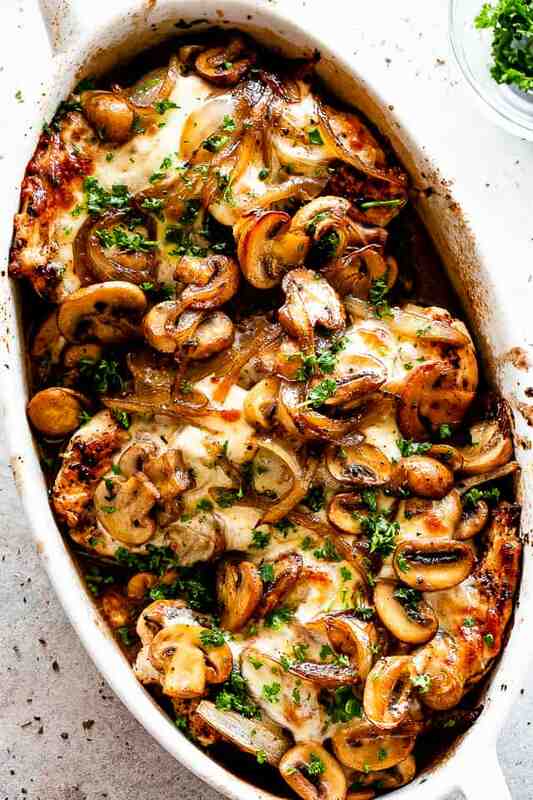 Oven Baked Chicken with cheese and mushrooms mixed through is a fabulous way to step up your dinner. Packed with flavor with just a handful of ingredients, you are about to have one of the BEST and easiest chicken recipes. It’s also low in carbs, Keto-friendly, with enough protein to keep you going and going. This meal is simple to make in about 40 minutes, from start to finish, and will hit the spot even with picky eaters. My 9-year old requests it once a week and she is PICK-YYYY! It’s a recipe I can count on to yield tender and flavorful mushroom chicken each and every time. Besides, my family is crazy for mushrooms, so we make this recipe quite a lot. We start with cooking onions and mushrooms in a skillet for 5 minutes. In the meantime, grab a meat mallet and pound the chicken down to about 1/4-inch thickness. Transfer half of the cooked mushrooms mixture to a baking dish; set aside the rest because we will use those to top the chicken. Season chicken breasts and add to the skillet where you cooked the mushrooms; cook each chicken breast for 2 minutes per side, or until golden brown. 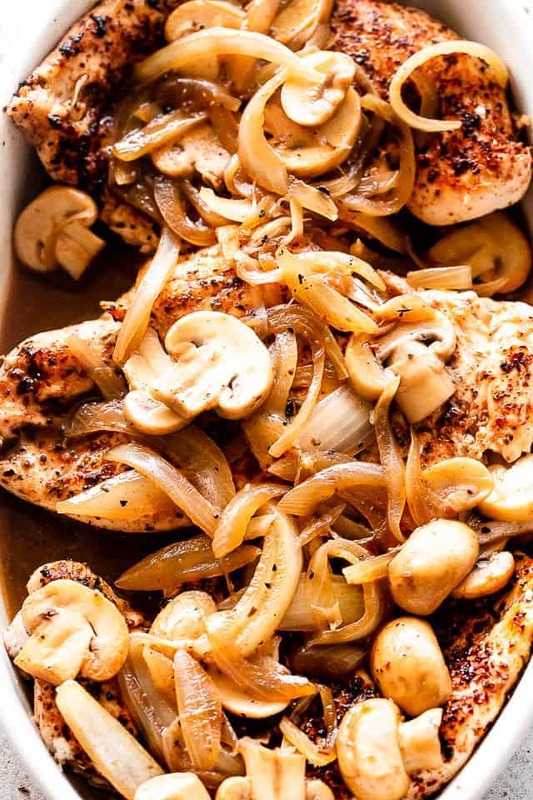 Remove chicken breasts from skillet and arrange over mushrooms in the baking dish. Return skillet to the stove; add chicken broth and scrape up the browned bits. Bring mixture to a boil and cook for 5 minutes, until liquid is reduced. Top chicken breasts with the rest of the mushrooms mixture, add cheese, and pour in the prepared liquid. Pop in a 375F preheated oven and bake for 15 minutes, or until chicken is cooked through and cheese is melted. Serve this Mushroom Baked Chicken with a big green salad, or over a bed of rice, pasta, or Zucchini Noodles. It is a total crowd pleaser, and a great choice for a satisfying meal. HOW LONG DOES IT TAKE TO BAKE CHICKEN BREASTS? Chicken breasts need 20 to 22 minutes of bake time in a 375F degree oven. However, cooking time also depends on the thickness of the chicken breasts – thicker breasts will need more time to cook. Use a meat thermometer to check that the internal temperature of the cooked chicken is 165F. If you follow my brined oven baked chicken recipe, you can bake thicker chicken breasts in a 425F-degree oven for 20 to 25 minutes. A 3-ounce boneless, skinless, chicken breast has around 140 calories, 3 grams of fat, and only 1 gram of saturated fat. The healthiest way to eat chicken breasts is to bake in the oven or have it grilled. Calories do increase when you add fats and other ingredients to the chicken. 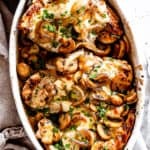 Cheesy Baked Chicken with Mushrooms - An easy recipe for baked chicken breasts covered in melty mozzarella cheese and layered with deliciously caramelized mushrooms. 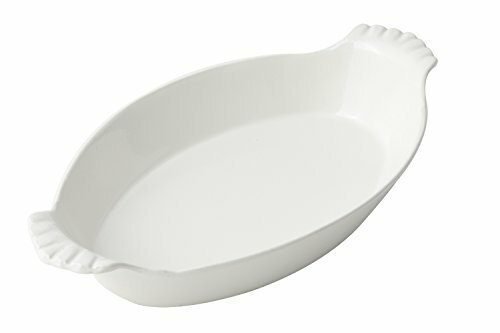 Lightly grease a 9x13 baking dish with cooking spray and set aside. 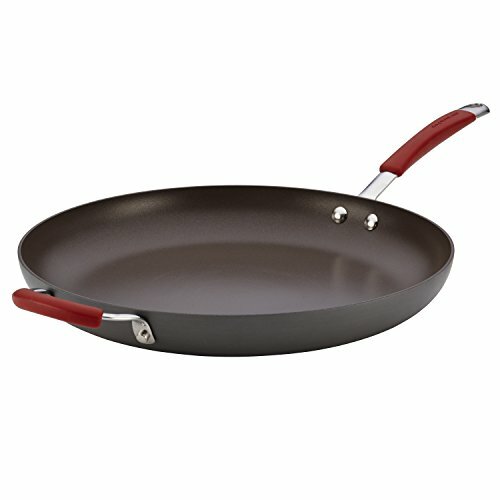 In a large skillet over medium-high heat, melt 1/2 tablespoon butter and add 1/2 tablespoon olive oil. 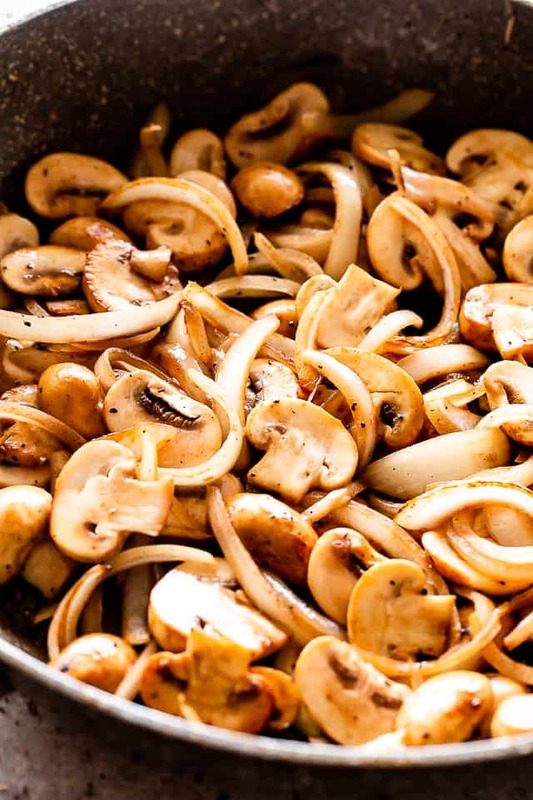 Add sliced mushrooms and sliced onions to the skillet; season with salt and pepper, and cook for 5 minutes. Stir in the garlic and cook for 30 more seconds, or until fragrant. Transfer half of the mushrooms mixture to the prepared baking dish; set the rest aside for later. Return skillet to heat and add the rest of the butter and olive oil. Season the chicken breasts with salt, pepper, garlic powder, paprika, and Italian Seasoning. Add chicken breasts to the hot oil - you may have to do this in batches if skillet isn't big enough - and cook chicken breasts for 2 minutes per side, or until lightly browned. Return skillet to the stove; add chicken broth and scrape up the browned bits. Bring mixture to a boil and cook for 4 to 5 minutes, or until liquid is reduced. Top chicken breasts with the rest of the mushrooms mixture, add cheese over the chicken breasts, and pour in the prepared chicken broth. Bake uncovered for 15 minutes, or until chicken is cooked through. Store in an airtight container and keep in the fridge for up to 3 days. I’ve been looking for different chicken dishes and this popped up. I love mushrooms, my husband loves onions, so this was perfect. It was delicious! Quick and easy to make! Thanks for a great recipe. I love all things mushroom so this is right up my alley. This has to be added to my menu this week! Looks so good! What a great meal for my family! They will gather around the table fast for this dish; looks amazing! What a delicious weeknight meal! Thanks for a great recipe!! This looks so delicious and creamy! 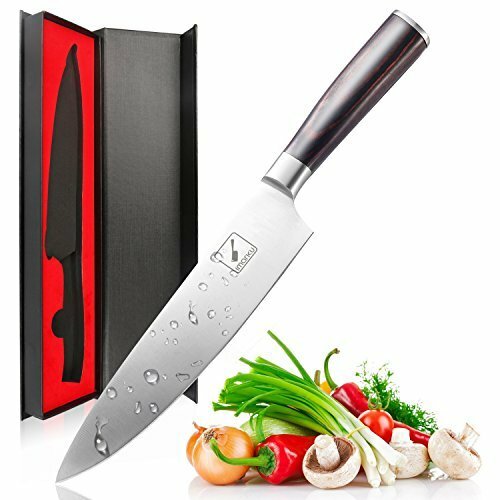 I can’t wait to try it for dinner! I will be adding this to the menu! It looks fabulous! I love trying new chicken dishes! My dream dinner. I have to make it when my husband (the mushroom hater) isn’t home. I LOVE THIS DISH. This looks amazing! Perfect way to change up our chicken dinner routine. What a delicious looking meal! Worthy to be served in 5 star restaurant, indeed! Wow! I know what I am making for dinner; this looks devine!! This looks SO yummy! I can’t wait to try it for dinner this week! This recipe is SO SO good! I was super glad I tried this. My whole family loved it! This looks so delicious! Definitely a must make dinner for my family!